Reports of an economic review meeting to be chaired by the prime minister over the weekend helped the rupee make a dramatic recovery during the end of the trading hours on Wednesday, closing the session at 72.19 against the dollar. In addition, a strong intervention by the central bank and exporters selling dollars helped the rupee to appreciate, said dealers. The currency touched a record low of 72.92 per dollar before it gained as much as 1.4 per cent to stand at 71.90. The partially convertible rupee ended the session at 72.19 per dollar. With this, the rupee has posted its biggest single-session rise against the dollar since May 25. 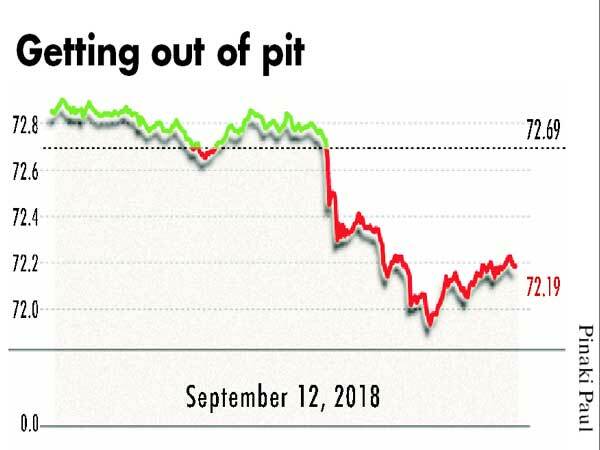 Traders said the sentiment got a boost after reports that PM would hold a meeting to discuss the current economic scenario and to assess measures to stem the fall in rupee's value over the weekend. The government is also expected to announce measures to check the rise in oil prices, traders further said. “We still do not think a pre-emptive rate hike over the weekend is warranted at this point and the policy makers can explore other tools as well… rupee’s effective reaction beyond the knee-jerk today will depend on the severity of measures adopted by the policymakers. We continue to maintain the Dollar-rupee range at 69-74 for remainder of FY19 but will closely watch out for the policy space,” added Arora. India’s benchmark bond yield ended at 8.13 per cent, down 5 basis points on the day and retreating from the day’s high of 8.23 percent, its highest since November 14, 2014. The rupee has lost almost 4 per cent its value in last 10 days of incessant depreciation and nearly 12 per cent since January making it one of the worst performing Asian currencies on account of higher oil prices, an emerging markets sell-off and widening India’s current account deficit.